The Peter Starr House was built in 1822 by a prominent Middlebury family whose name now also graces two buildings at Middlebury College (Starr Hall, a residence hall for upperclassmen, part of Old Stone Row, among the oldest buildings of the College) and Starr Library (now home to the Axinn Center for Literary and Cultural Studies). 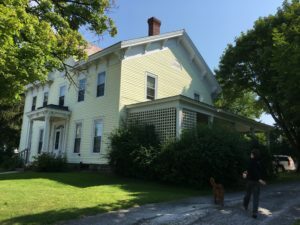 Located halfway between Town Hall Theater and Two Brothers Tavern, one-half mile to the Davis Family Library, the Peter Starr House is perfect for car-free living in Middlebury! Reconfigured in the twentieth century to accommodate five apartments that vary in size from 730 to 1376 square feet, it also features a full basement with ample storage for residents’ convenience. The three largest apartments each has full-size laundry appliances. Heat and hot water charges are billed separately from the rent. Electric and telecom service is direct billed from the providers. The property also features off-street parking for all residents’ vehicles (allocated at one per bedroom). There are currently no apartments available. When they are, however, they can be configured and managed as Airbnb units with revenue credited against the rent (up to the monthly total, including utilities). The lease year runs from August first through July 31, but flexible lease terms are available. Some furnishings available. No pets, no smoking; no exceptions. Please use the handy contact form to contact us for further information.